Blackbeard's Queen Anne's Revenge Found? 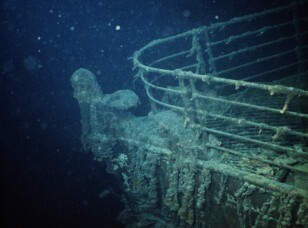 The Titanic, the 46,000-ton "unsinkable" ocean liner that struck an iceberg on its maiden voyage in 1912 and sank within hours to the bottom of the North Atlantic, is the world's most famous shipwreck. To this day, the voyage, its passengers, even the mysterious Cold War details surrounding its 1985 discovery continue to capture the public's fascination. But the Titanic is not the only wrecked ship steeped in history — if not treasure — discovered on the bottom of the sea. Click the "Next" arrow above to learn about nine more shipwrecks that have enriched our imaginations. An ancient Greek cargo ship, described by one researcher as a UPS truck of its day, sank with what appears to be a load of oregano-flavored olive oil. At least, that's the result of a genetic analysis of residue in one of the ship's earthenware jars that were hauled up from the 200-foot depths of the Aegean Sea where the ship sank around 350 B.C. 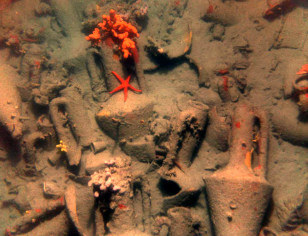 The wrecked ship, which was discovered by an underwater robot, contained several hundred of the jars, called amphorae. More than two-thirds were of the style of the one containing the olive oil. Other containers likely held wine, a well-known export from the island of Chios. 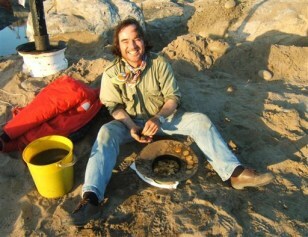 Geologists hunting for diamonds off the coast of Namibia stumbled upon a different sort of riches when they hit upon a shipwreck full of copper ingots, elephant tusks and gold coins. The discovery was reported by Namdeb Diamond Corp, a joint venture between diamond giant De Beers and the government of Namibia. Preliminary analysis indicates the well-worn Spanish or Portuguese ship likely went down in stormy weather in the late 1400s or early 1500s. Judging from the cargo, researchers said the ship was likely looking for material to build cannons or was perhaps trading in ivory. This image shows coins and a brass divider recovered in the wreckage. In 1622, a fleet of 28 Spain-bound ships laden with gold, silver, copper and other riches reaped from the New World was snared by a violent hurricane in the Florida Strait. At least six of the boats sank, their loot no longer bound for the crown. 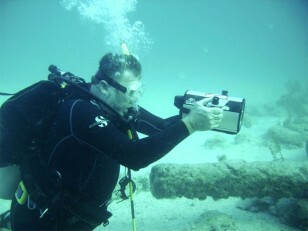 Modern day explorers, however, have scoured the waters for the sunken treasure. Riches from the heavily armed Nuestra Se�ora de Atocha started coming to light in the 1970s and the scattered fortunes of a second ship, the Santa Margarita, were hit upon in 1980. 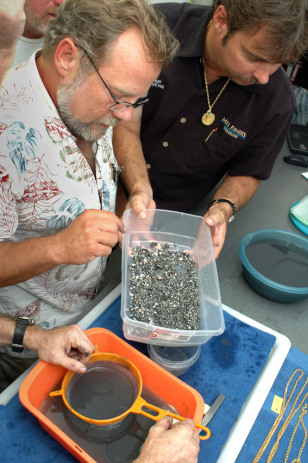 In more recent years, divers from Blue Water Ventures Key West have been hot on the Santa Margarita's trail, recovering millions worth of treasure including the pearls shown here. The wreckage of the Quedagh Merchant, a ship abandoned by Scottish privateer William Kidd in the 17th century, has been discovered in shallow waters off a tiny island in the Dominican Republic and turned into an underwater preserve. Captain Kidd spent much of his life as a privateer  and captured the Indian-owned Quedagh Merchant which was laden with satin, silks, silver, gold, and other riches. But he abandoned the ship in 1699 to address charges in New York that he was a pirate, not a privateer. According to historians, the men entrusted with the ship looted it, burned it, and set it adrift. It was found just 70 feet off the coast of Catalina Island at a depth of only 10 feet. 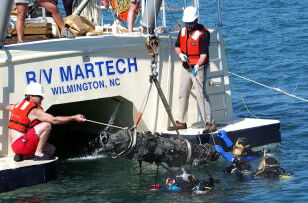 Archaeologists believe the cannon shown here being hauled up off the coast of North Carolina was part of the notorious pirate Blackbeard's flagship. According to legend, Blackbeard, whose real name was thought to be Edward Teach or Thatch, commandeered the French slave ship La Concorde in 1717 and renamed it the Queen Anne's Revenge. Blackbeard abandoned the ship when it ran aground off the North Carolina coast. Several artifacts recovered from the wreck appear to support the belief that it was Blackbeard's flagship, though the findings have been questioned by some scholars. Ongoing excavations may one day solve the mystery. A famous British warship sunk by a violent storm in 1744 was discovered 330 feet deep in the English Channel, more than 50 miles from a group of rocky islets long implicated in the vessel's demise. The discovery exonerates the HMS Victory's commander, Sir John Balchin, and a lighthouse keeper near the rocks who was prosecuted for failing to keep the lights on, according to researchers with Odyssey Marine Exploration who found the sunken vessel that carried at least 900 men. What's more, the 110-gun ship is thought to contain 4 tons of gold coins. 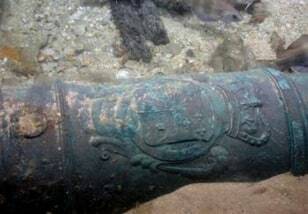 This image shows one of the ship's bronze cannons with the royal crest of King George I. The governments of Peru and Spain are caught up in court battles with a Florida-based exploration firm that recovered an estimated $500 million worth of silver coins from a Spanish frigate sunk by a British warship in 1804. Marine Odyssey Exploration announced the discovery of the treasure in 2007, though tried to keep the ship's origins and exact Atlantic Ocean location a secret. The details began to leak in 2008 as the Spanish government laid claim to the treasure if it indeed was from the sunken Nuestra Senora de las Mercedes. Peru has since weighed in with a court challenge of its own, saying the coins were made with Peruvian silver and minted in Lima. 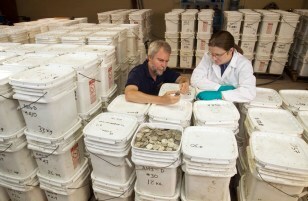 In this file photo, Odyssey Marine Exploration co-founder, Greg Stemm, left, examines the loot with a co-worker at an undisclosed location. The discovery of an ore carrier some 460 feet beneath the surface of Lake Superior has only raised the intrigue over why the vessel sank on just its second voyage. 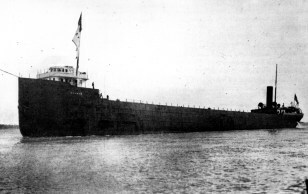 The Cyprus was hauling iron ore from Superior, Wisconsin to Buffalo, New York, when it encountered a moderate gale on October 11, 1907. But the storm was insufficient to bother other ships that day. At the time, some mariners suspected water entered through the ships newly designed hatch covers, though a labor riot at the time of the vessels construction could have created other flaws. While this remains unsolved, shipwreck researchers have another mystery to resolve: The Cyprus was found 10 miles north of where its sole survivor said it went down. The ship on her maiden voyage is shown in this image. The Polish Navy is almost certain they've located the remains of Nazi Germany's only aircraft carrier, the Graf Zeppelin. The ship was launched in 1938, though it never saw action as Adolf Hitler's interest in the navy waned during World War II. The Soviet Union took control of the ship after Germany's defeat and used it for target practice in 1947, according to historical accounts. The carrier eventually sank but its exact whereabouts were unknown until the Polish Navy found remains with an underwater robot. 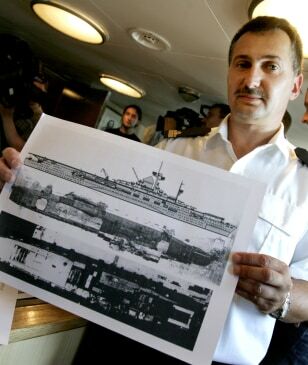 In this image, Polish Navy Commander Daniel Beczek holds up a photo with three views of the ship: the top is a drawing, the middle is a sonar image made by the navy, and the bottom is a 1930s construction photo.